On Friday morning, it appeared to be clear weather, so we decided to take another trip outside town. This time to the city of Haarlem, which was recommended because it has a pretty, old, central section. Once again, we took a tram to the central station, and then, after a bit of confused guessing, got tickets, and figured out which train to take. We got on the train, and Donnie settled in her seat and prepared herself for a long restful ride. The ride was only 10 minutes long. As we approached the Haarlem train station, out of the window I saw a windmill. We got off the train and were immediately dazzled by the wonderful old train station. 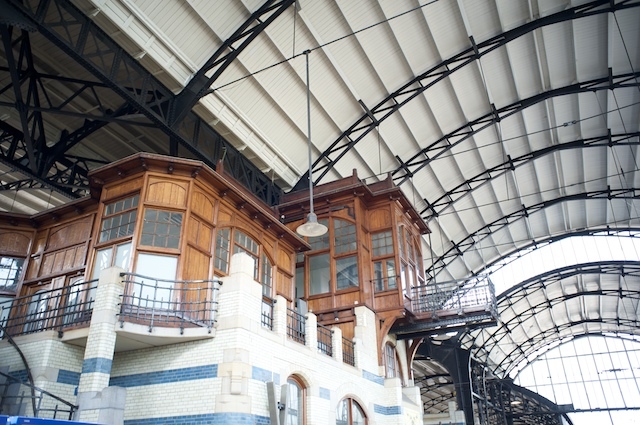 The train station was like most in Europe, with a big glassed in cover over the tracks, but the middle of this station was the old station from the art deco period of the early 1900's, with lots of beautiful wood panels and beveled glass windows, and tiles. We took lots of pictures. We then walked a few blocks from the train station to the center of town. This is easy to do in many European cities and towns because there are signs everywhere saying "centrum" or "zentrum" or something similar. We got to the old part and started taking lots of pictures. We wandered the old streets for a while, and then got to the old market square, called the Grote Markt. 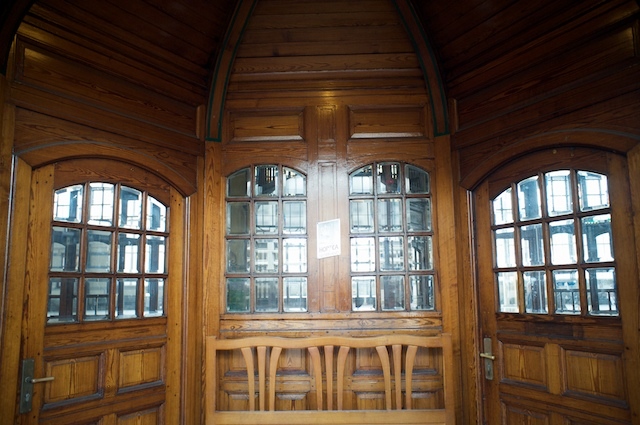 It was surrounded by pretty, old buildings and the lovely old St. Bavo Church, and it had several cafes and restaurants with outdoor tables, and, of course, a herring stand. 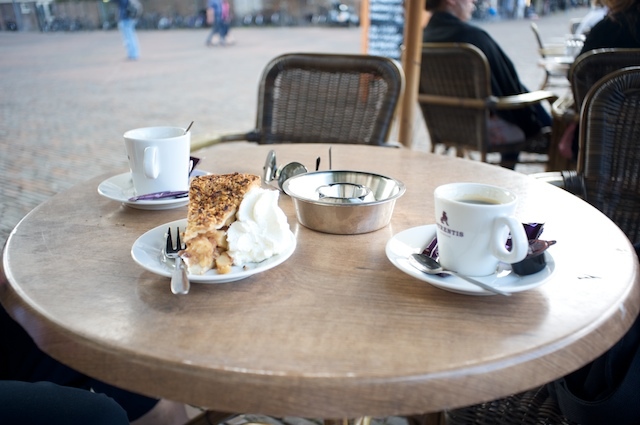 We decided to sit at one of the cafes and have coffee and apple pie with whipped cream. Afterward we walked around the city for a while, taking lots of pictures and wandering the old canal-lined streets. 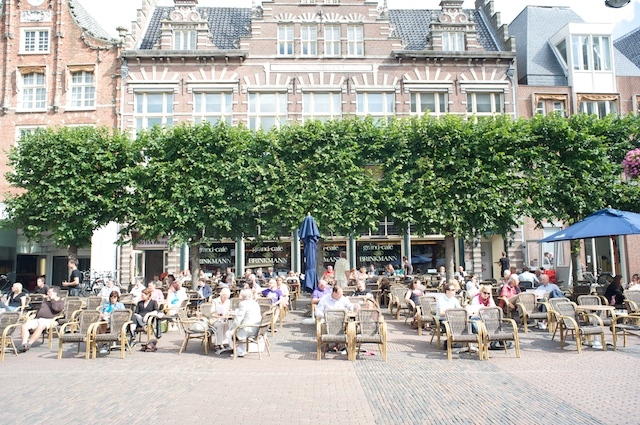 Eventually, we found ourselves back at the Grote Markt, in time for lunch. We sat at another outdoor cafe and had a nice, leisurely lunch. After lunch, about 2:00, we went into the St. Bavo Church. Wow! 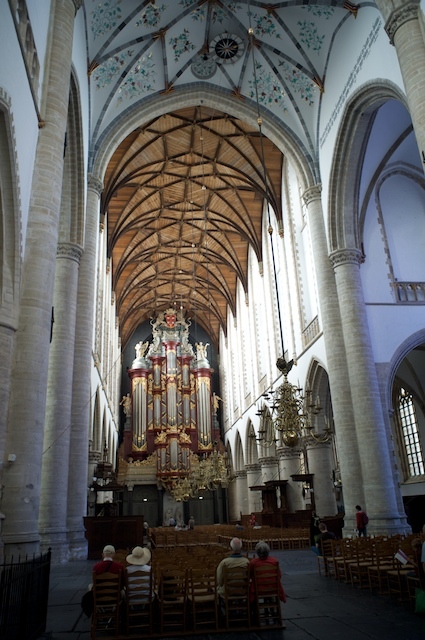 The St. Bavo Church is dominated by a huge pipe organ at one end of the nave. 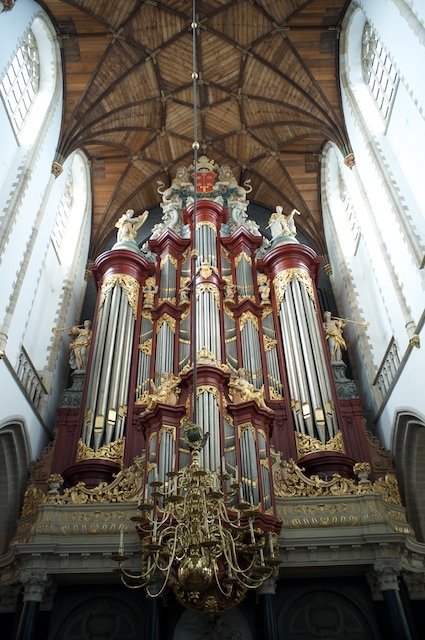 The organ dates from the early 1700's, is almost 100 feet high, has over 5000 pipes and was once played by Mozart and Handel. The organ was playing! The church organist was practicing for Sunday's service. It was marvelous. The St. Bavo Church was very plain and yet beautiful inside also. The floor was made up entirely of graves. When we were leaving, we were talking to the lady who had taken our admission fee, and she said we were very lucky to be there for the organ practice. She also told us how to get to the windmill and then gave us a city map. We thanked her, and started walking in the direction she had indicated. 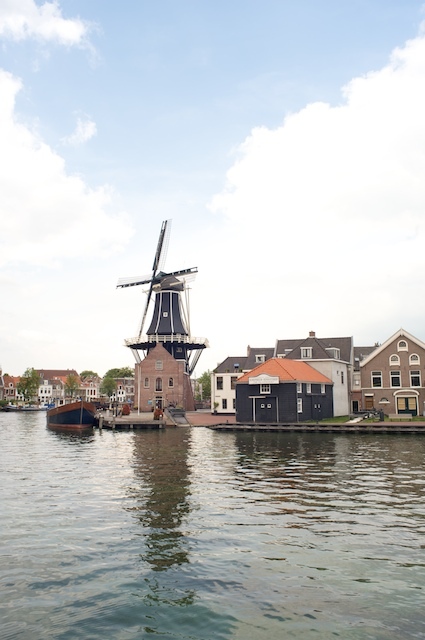 After a few minutes, we suddenly saw the windmill, right in the middle of a residential district, surrounded by streets full of houses. We walked up to the windmill and started snapping pictures like crazy, and after a minute or so, a man approached us and asked if we wanted to see the windmill. We said yes, and he said that the last tour was just starting, so we went with him into the base of the windmill. He was the guide, and gave us and a small group of French people a wonderful tour of the windmill, in English because he had very little French. The tour started with a small video presentation, which was very interesting. It started with a man playing the Irish-style bagpipes, so we assumed that they were also a Dutch instrument. Later we asked the guide, and he said that the video surprised him also, because he was unaware of such an instrument being used in the Netherlands. The video also showed an old movie clip of the windmill on fire in the 1930's. It burned down, and was only rebuilt in 2002! The guide then took the group up into the windmill, floor by floor, showing us models of how the windmill was constructed, and how it was used. 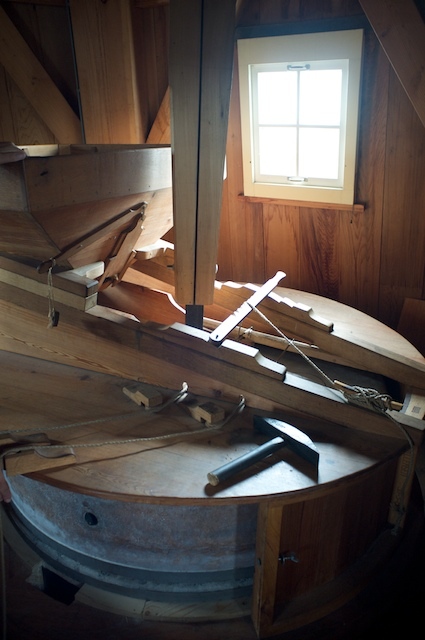 It was used for different purposes over the years, including a sawmill, grain mill, and others. We also saw a video of the miller setting the sails. To get to the upper floors, we had to climb several flights of very, very steep narrow stairs, just like ship's ladders. Later, to come down, you had to come down backwards! The windmill tour was a kick. We then wandered back to the train station, took the train back to Amsterdam and took the tram back to the hotel. Haarlem was a very pretty city, sort of a small, non-touristy, not-crowded, Amsterdam. 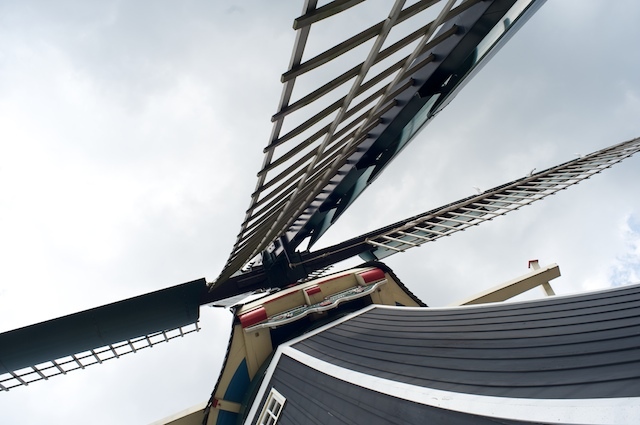 By the way, we cannot believe how many English words appear to be identical, or very similar to Dutch. Fish is Vis. Eat is eet. Bread is brood, etc. etc. We have much less difficulty reading signs and menus than in any other non-English-speaking country, and we have yet to find a Dutch person who didn't speak excellent English.